In this article, the Longevity team shares one of their favorite books with you. For this one, the topic of money is being discussed. Have you ever spent your salary in a couple of weeks and had nothing to show for it? While some women seem to know how to stretch every cent they earn, others seem to be forever drowning in debt. The difference between the two is a simple: one is a “smartwoman” and the other is not. 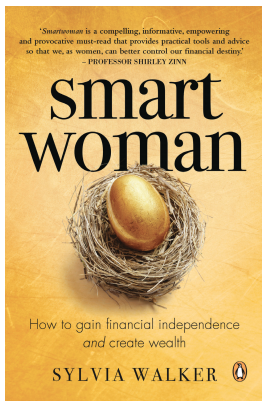 Smartwoman: How to Gain Financial Independence and Create Wealth – Sylvia Walker. Sylvia Walker is a South African finance expert who asks her readers this question: would you rather have money or knowledge? In her opinion, a “smartwoman” would pick knowledge over money, and it’s this choice that sets her apart from the rest. In her book, Walker explains how any woman can become more financially savvy and, ultimately, a “smartwoman”. The book illustrates how our perception of money affects our spending habits. It then goes on to provide readers with financial solutions to their concerns – earnings, savings, investments or spending – depending on what stage of their life they’re in, whether it’s at the beginning of adulthood, marriage or even divorce. As finances can be a massive source of stress, click here to find out how it can make us sick, and how to avoid this fate. What makes this a good book? Living in a world that is placing increasing value on material possessions, it can be difficult to differentiate between what you actually need and what you want. I enjoyed how Walker was able to address the daily issues we all seem to experience, and provide easy and manageable advice on how to make smarter decisions that can both grow your wealth and help you to achieve your goals. The book may appear overwhelming, as each page is full of financial information – but it is well worded and easy to grasp, however much of a finance novice you are. But what made it a winning read for me is how Walker also offers advice on how to develop a healthy mindset towards being financially savvy, and get rid of behavior that hinders it. Whether you’re wanting to fix up your finances or accomplish your goals, it’s time to get smart. For more ways on how to make the most of your income, click here. Suicide Rates Are Rising – Is The Act Contagious?